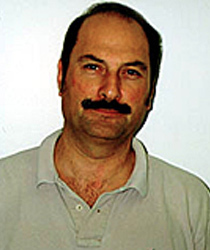 Professor Agis A. Iliadis is the Director of the Semiconductor Nanotechnology Research Laboratory and a member of the Maryland NanoCenter. He received his M.Sc. and Ph.D. degrees in Electrical Engineering, from the Department of Electrical Engineering and Electronics, University of Manchester Institute of Science and Technology (UMIST). His expertise is in the areas of nanotechnology, sensors, semiconductor devices/circuits, and CMOS IC technology. Current research focus is in novel sensors and nanotechnology compatible with CMOS IC technology for developing multi-functionality in CMOS ICs, smart sensor arrays, and nanodevices. His contributions are in the development of self-assembled nanostructures and nanocomposite copolymers on Si CMOS wafers, ZnO and SiC wide band-gap semiconductor devices and technology, gas sensors, heterojunction field effect transistors (HEMTs), SOI MOSFETs, light emitting devices in III-V semiconductors, light emission in Si, ohmic contacts, thin film epitaxial growth, improved metal/semiconductor and oxide/semiconductor interfaces, and electromagnetic interference (EMI) in CMOS integrated circuits. He is a senior member of the IEEE, a Distinguished Lecturer in the IEEE-EDS Society, an AdCom member of the IEEE-EDS Technical Committee on Electronic Materials, an AdCom member of the IEEE EDS Educational Activities Committee, and the EDS Representative to IEEE-USA Professional Activities Board (PACE). He is a member of MRS, LEOS, InstPhys (UK), SPIE, TMS, DEPS, and ECS and organized and served in several Conference Committees. The R. F. Bunshah Award for Best Paper in the 2004 International Conference on Metallurgical Coatings and Thin Films (ICMCTF'04), 2004. Best Paper Award: "Development of High Sensitivity IL-6 Biosensors", 3rd International Greek Biotechnology Forum (IGBF), Athens, Greece, Oct. 5-7, 2006. Certificate of Appreciation: IEEE EDS Distinguished Lecturer: AdCom Meeting, Washington DC, 2007. R. F. Mulligan, A. A. Iliadis, P. Kofinas "Synthesis and characterization of ZnO nanostructures templated using diblock copolymers", J. Appl. Polymer Science, 89 (4), pp. 1058-1061 (2003). Abhishek Motayed, Ashok Sharma, Kenneth A. Jones, Michael A. Derenge, Agis A. Iliadis, S. Noor Mohammad "Electrical characteristics of Al x Ga 1-x N Schottky diodes prepared by a two-step surface treatment", J. Appl. Phys. , 96(4), pp. (2004). H. A. Ali, A. A. Iliadis, U. Lee, "Study of ZnO Nanocluster Formation within Styrene-Acrylic Acid and Styrene-Methacrylic Acid Diblock Copolymers on Si and SiO 2 Surfaces ", Solid State Electronics , 48 (10-11), pp. 2025-2030 (2004). K. Kim, A. A. Iliadis, V. Granatstein, "Effects of microwave interference on the operational parameters of n-channel enhancement mode MOSFET devices in CMOS integrated circuits ", Solid State Electronics , 48 (10-11), pp. 1795-1799 (2004). G. Krokidis, J. Xanthakis, A. A. Iliadis, "A Modeling of the Optical Properties of the Zinc Oxide-Zinc Magnesium Oxide Double Barrier System", Solid State Electronics , 48 (10-11), pp. 2099-2102 (2004). A. Motayed, K. A. Jones, M. A. Derenge, M. C. Wood, D.N. Zakharov, Z. Liliental-Weber, D. J. Smith, A. V. Davydov, W. T. Anderson, A. A. Iliadis, S. Noor Mohammad, "Electrical, microstructural and thermal stability characteristics of Ta/Ti/Ni/Au Contacts to n-GaN", J. Appl. Phys. , 95 (3), pp. 1516-1524 (2004). Jahangir Alam, Ravi Bathe, R.D. Vispute, John M. Zavada, Cole W. Litton, Agis A. Iliadis, S. Noor Mohammad, "Effect of dislocations on luminescence properties of silicon doped GaN grown by metal organic chemical vapor deposition method", J Vac. Sci. Tech. B , 22 (2), pp 624-629 (2004). H. A. Ali, and A. A. Iliadis, "Comparative study of self-assembled ZnO nanostructures in poly(styrene-acrylic acid) diblock copolymers -- [PS] m /[PAA] n -- on Si and SiO 2 /Si surfaces" , Thin Solid Films , 469-470C, pp 425-430 (2004). H. A. Ali, A. A. Iliadis, " Thin ZnO Nanocomposite Poly(styrene-acrylic acid) Films on Si and SiO 2 Surfaces " Thin Solid Films , 471, pp 154-158 (2005). Krishnamoorthy Soumya, Bei Thaleia, Zoumakis Emmanouil, Chrousos P. George, and Iliadis A. Agis, "Morphological evaluation and binding properties of Interleukin-6 on thin ZnO layers grown on (100) silicon substrates for biosensor applications", Biosensors and Bioelectronics , 22(5), pp. 707-714, 2006 . C. Pandis, ? . Brilis, E. Bourithis, D. Tsamakis , H. Ali , S. Krishnamoorthy, A. A. Iliadis, and M. Kompitsas, Low-Temperature Hydrogen Sensors Based on Au Nanoclusters and Schottky Contacts on ZnO Films Deposited by Pulsed Laser Deposition on Si and SiO 2 Substrates", IEEE Sensors Journal , 7 (3), pp 448-454 (2007). C. Pandis, ? . Brilis, D. Tsamakis , H. Ali , S. Krishnamoorthy and A. A.Iliadis, " Role of Low O2 Pressure and Growth Temperature on Electrical Transport of PLD Grown ZnO Thin Films on Si Substrates", Solid State Electronics , 50 (6), pp. 1119-1123 (2006). H. A. Ali, A. A. Iliadis, and L. J. Martinez-Miranda, "Structural and Rectifying Junction Properties of Self-assembled ZnO Nanoparticles in Polystyrene Diblock Copolymers on (100) Si Substrates", Solid State Electronics , 50 (6), pp. 1105-1112 (2006). S. Krishnamoorthy , and A. A. Iliadis, "Development of High frequency Love Mode Surface Acoustic Wave ZnO/SiO2/Si Devices", Solid State Electronics , 50 (6), pp. 1113-1118 (2006). ?ikos Brilis, Dimitris Tsamakis, Hasina Ali, Soumya Krishnamoorthy and Agis Iliadis, 'Acceptor band and hopping conduction in p-type undoped ZnO films grown by pulsed laser deposition on (100) Si substrates', Thin Solid Films, accepted October 2007. K. Kim, and A. A. Iliadis, "Impact of Microwave Interference on Dynamic Operation and Power Dissipation of CMOS Inverters", IEEE Trans. Electromagnetic Compatibility , 49 (2), pp. (2007). K. Kim, and A. A. Iliadis, "Critical Upsets of CMOS Inverters in Static Operation due to High Power Microwave Interference", IEEE Trans. Electromagnetic Compatibility . In Press, 2007. Professor Nikos Konofaos will join ECE Professor Iliadis' research team. Berkovich, Chu, Kabkab, Mukherjee, and Tsung-Hsueh Lee will join the 2013 program to prepare for their academic careers. Event is held March 30-31 in Arlington, Va.
Iliadis helps to make the International Semiconductor Device Research Symposium (ISDRS) a success at UMD. Iliadis invited to speak for Baltimore Chapter of the Electron Devices and Solid-State Circuits Societies on April 29. ECE professor speaks on novel zinc oxide nanosensors on silicon wafers, chairs committee on IEEE graduate fellows. Kyechong Kim and Xiangrong Zhou were among a select group of UMD students to receive the fellowship. ECE professor earns first prize for paper on high-sensitivity biosensors. ECE professor receives $240,000 grant to develop ultra-sensitive biosensors. Krishnamoorthy, an advisee of Agis Iliadis, was one of 30 UM fellowship recipients.